All concrete swimming pools need coping, which is a cap for the edge of the pool. 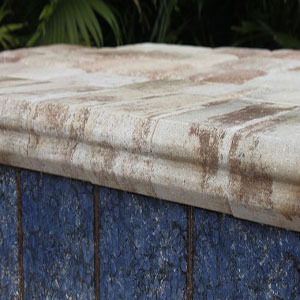 Besides simply being necessary, the coping provides an opportunity for a decorative accent, which can greatly enhance the appearance of the pool. When someone inside the pool hangs on to the top edge, that’s the coping they’re grabbing on to the coping. Coping is mounted on top of the pool beam, covering its concrete edges and providing a transition to the pavers. It also prevents water from getting behind the pool shell and integrates the finish and tile of the swimming pool. Coping comes in many different lengths and styles. 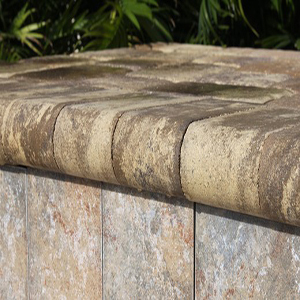 The most common style in southwest Florida is the 4×9 regular bullnose. Most pavers are multiple colors and coping can be matched or contrasted with solid colors. 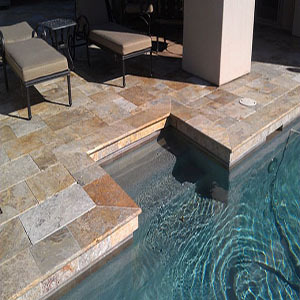 If you decide to upgrade the deck to a natural stone, such as travertine, a 12×24 coping can be used provided all the corners in the pool are 90 degrees. In lieu of coping stones, some pool designs feature concrete or wood decking that extends to or slightly over the edge of the pool. Materials include flagstone, brick or synthetic decking. Call 239-237-3338 today for more information.